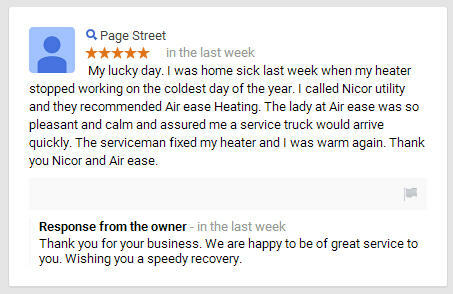 Our extensive experience with Air-Ease Heating & Cooling based in Tinley Park, Illinois, allowed us to learn about their strategies and charades related to online reviews posted by their customers (themselves, relatives and/or friends). As we've mentioned before, we do not know about the existence of a real satisfied customer who would recommend this company (we asked multiple times for this information, but Air-Ease was unable to provide). So with high probability, we may assume that we are their typical customers (ie. unsatisfied to say the least). Here is what happens when an Air-Ease customer posts a negative comment or review of their company. - PUT BLAME ON CUSTOMER'S NEGLIGENCE. Air-Ease tries to shift the blame to something else, like customer's reckless actions or inactions. When something they have serviced doesn't work as it should (or it completely fails to work), they could blame, let's say, a 'defective installation' by another contractor or 'lack of proper system maintenance.' If you prove them wrong again, they change their tone and now try to persuade the world that you are too stupid to understand how it should work. - PUT BLAME ON CUSTOMER'S IGNORANCE. Air-Ease claims you know nothing about your HVAC setup and your questioning their 'extensive HVAC knowledge and experience' is in bad taste (to say the least). Or that you are unable to determine if air coming out from your ventilation system is hot or cold. For instance, you tell them that your air-conditioner is blowing hot air and they would reply that this is how it was designed and since it is still blowing air at all, there's nothing wrong with it. This is the moment when they try to self-establish themselves as a 'qualified and reputable' contractor and put you, as a customer, into the 'Air-Ease idiot box.' Your system set up or repaired by Air-Ease is constantly malfunctioning, but, according to them, there's nothing wrong with it because they call themselves 'qualified and reputable' so this is how things work. Right? - PROACTIVELY BLOCK CUSTOMER SOCIAL MEDIA PROFILE. First, they illegally publish as much private information about you (as their customer) as they can, then they totally misrepresent the facts, and finally they block you from giving you a chance to respond to the lies. We wish the Air-Ease staff was so proactive when it came to learning elementary knowledge about the basic laws of gravity and HVAC machines, geothermal system design and installation or professional heating and cooling system maintenance. - DEFAME. Attack your good name or character. This routine is probably their last chance to stay relevant. Have you demanded explanations what's really going on with the broken HVAC system they designed, installed, and maintained? Have you raised your voice at the incompetent technician / company owner when he pretends to know nothing (or actually knows nothing) about the cause of the constant system failures? Let's forget about the services shortcomings and failures and focus on your 'unacceptable' behavior instead. After all, this solves all the problems of your system and lets the contractor off the hook. And let's not mention the fact that the 'technician' tried to violate your intellect dozens of times by lying to you, misleading you, and denying that 2+2=4. - Air-Ease has their colleagues / friends / family members write positive reviews. Most of their 'positive' reviews are written by anonymous users and they don't refer to any particular service job. If anything, they are just legends and 'feel-good' stories that have nothing to do with any real service. Most of these reviews are general, nameless, and without a real address / location. Some of the positive reviews which are linked to 'real persons' reveal that these are in fact their family members of friends, not real customers. Who knows, maybe they do provide good service to their family and friends. 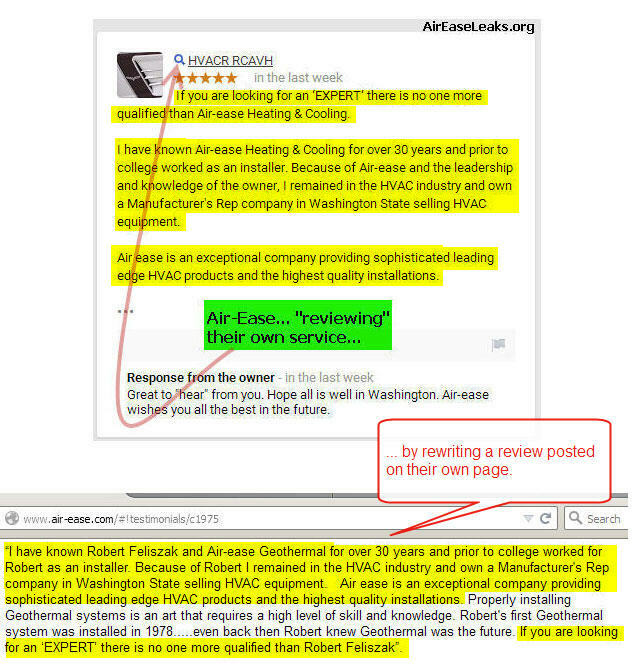 - Air-Ease manages at least two different Google accounts to post deceitful reviews. 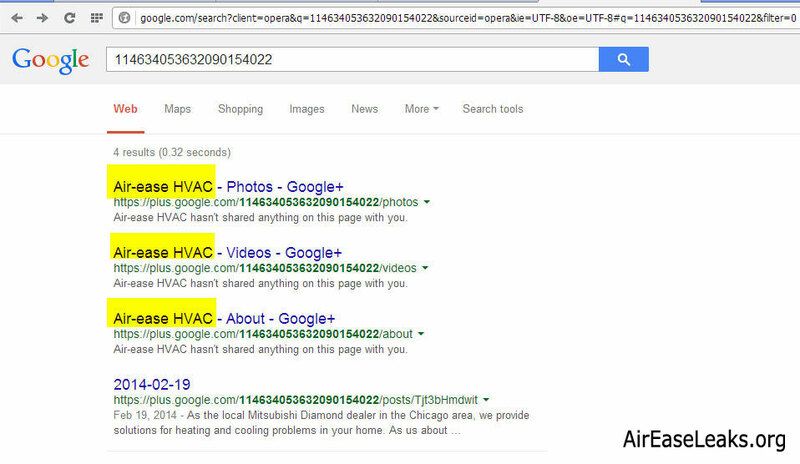 They have recently posted a fake 'positive' review of their own heating & cooling service. In other words, Air-Ease published under a fabricated name that Air-Ease is a great company. It's business as usual and nothing to be ashamed of, right? After all, there is nothing wrong with writing positive reviews for your own company. There's nothing better than phantom 'loyal customers' of Air-Ease Heating & Cooling. 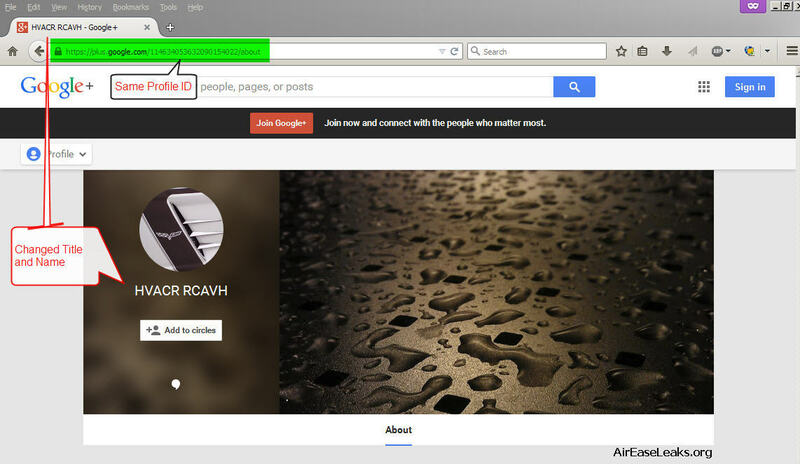 UPDATE: It now appears that the fake review by 'HVACR RCAVH' (former account name: 'Air-Ease HVAC') is now removed. The profile still exists. It's possible that Google connected the dots and automatically removed the untruthful review associated with the company. Or the company removed the review and their own response on their own. UPDATE 2: One deceptive review removed by Google and now another dubious one shows up. Notice how the 'reviewer' tries to defame 'another company' to put Air-Ease Heating & Cooling in a position of an 'expert' (cough, cough). Why 'Brandon' hasn't posted a review of the 'other company' instead? Maybe because he works for Air-Ease (yes, it is an undisputed fact that 'Brandon' exists and he does work for Air-Ease). Yet another coincidence? Probably not. There's also another possibility - Brandon hired another company to do his geothermal system because he was smart enough not to trust the company he works for. It's a shame he didn't share his insight information with us. Update to Update 2: After the deceit has been exposed, the virtual 'reviewer' has changed his username from 'Brandon Vzw' to 'galaxy note 3.' Username change doesn't change the facts though, does it. UPDATE 3: Here goes another inauthentic review. It was fabricated by the user who called themselves: 'Page Street.' He was home alone, lying sick in bed on one of the coldest days in Chicagoland (mentioning outside air temperature is yet another 'coincidence' considering the fact that Air-Ease in their blog posts cannot stop bragging about cold weather). Anyway, his heater stopped working.. so the first thing he did was to ... call Nicor. Calling Nicor Gas because a heater doesn't work is the fist thing anyone would do, right? It's as logical as calling a plumber when there is no Internet connection. But it doesn't stop there. Nicor (one of the biggest companies in Illinois) .. tada.. recommended Air-Ease Heating & Cooling to the poor guy! When one thought that one lie would be enough, another one immediately followed. So at this point we have a family member, Air-Ease employee, 'Galaxy Note', a friend, a page, and a couple of anonymous 'Google Users' who recommend Air-Ease services so far. Let us not forget about Nicor Gas and their imaginary employee. UPDATE 4: The following is another dubious review posted by someone who claims to have attended the "University of Shady Lane." At least this "reviewer" doesn't (initially) pretend to be serious about the review. He uses a lot of cliché words and statements in the hopes of gaining credibility and mentions the weather again (which may suggest the review has been guided by the company manager whose favorite topic is cold weather). Interestingly, the review appears to have been written a few months after the cold weather occured which adds to the shady argument. The reviewer claims that he initially "called a friend to fix his furnace." When his friend showed up, it turned out he didn't even know it was an electric fence (they apparently didn't discuss this relevant fact over the phone). Still, he tried to repair it, without success. 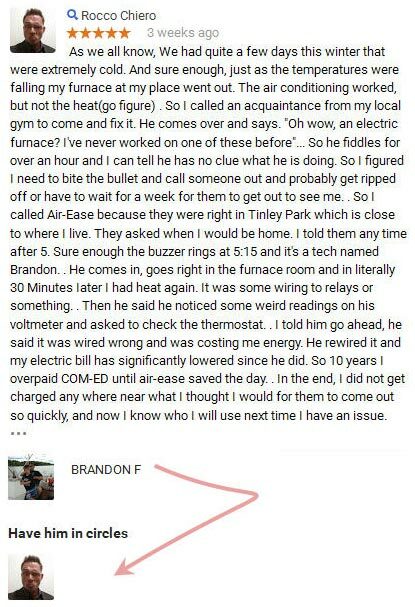 Then he called Air-Ease and Brandon F (the company worker - the same who used multiple names to provide reviews of their own company) showed up. Then the reviewer goes on with an artificial sales talk about saving money on energy. His "review" suggests he hasn't done furnace maintenance for 10 years (and doesn't mention that the Air-Ease worker would suggest that it needs maintenance, either). The story, while creative, doesn't make much sense. It is also very suspicious - the "reviewer" and "Brandon F" are now in Google Plus circle. Just like the other fake reviewers exposed above.